Today’s video shows another fancy fold card I was requested to make. Like Sunday’s card, this has been a delight to work on. It’s very easy to make, and will certainly give the recipient a WOW! This is the first card I made, and my favourite. 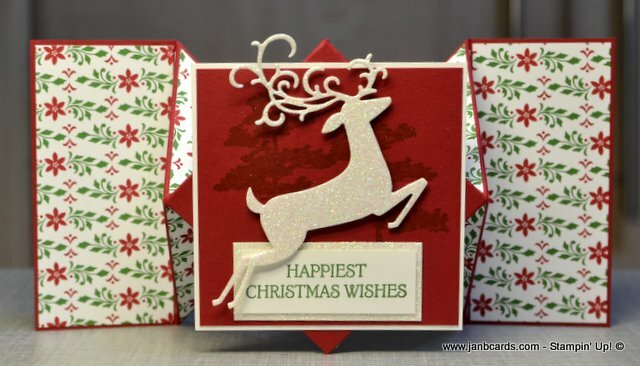 I decided to make this for the video, and the only change I made was to have dry embossed Whisper White Cardstock (CS) on Real Red CS for the central panel of the card. This worked really well, and now I’d like to see what the origianl would look like if the top Real Red CS layer was dry embossed. Initially I was going to use the Woodland Embossing Folder (EF) but decided against it, and went for Petal Burst EF because it had an all over design. I’m really pleased with the embossed element of this card. I used the same DSP for both these cards so it would give a fair comparison of the two central panels. 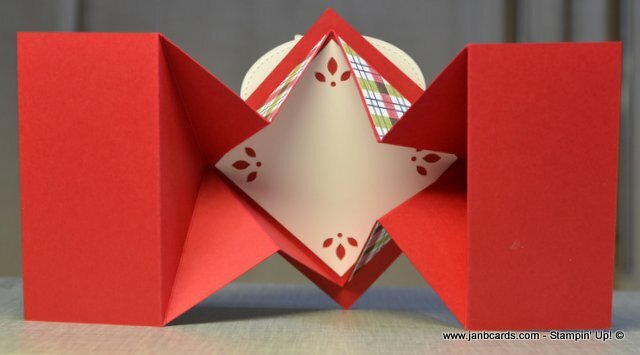 One question I’m always asked when I make fancy-fold cards is, where would I write my greeting. On this card I inserted an extra piece of Whisper White (CS) in the back fold, specifically for this purpose. 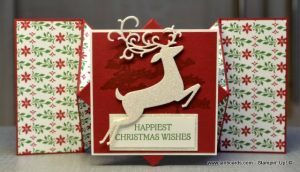 The greeting can be written with this layer in-situ, as long there isn’t too much embellishment on the front. Alternatively, if you prefer you can leave it until the last minute. This photograph can be a little mis-leading! 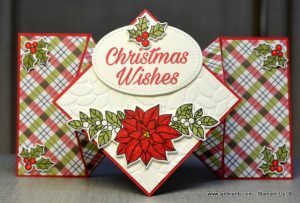 The white insert for the greeting is a square with cut outs, created with the Detailed Tria Punch, is a square. 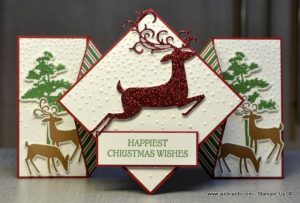 The curved white is from the oval sentiment on the front of the card. 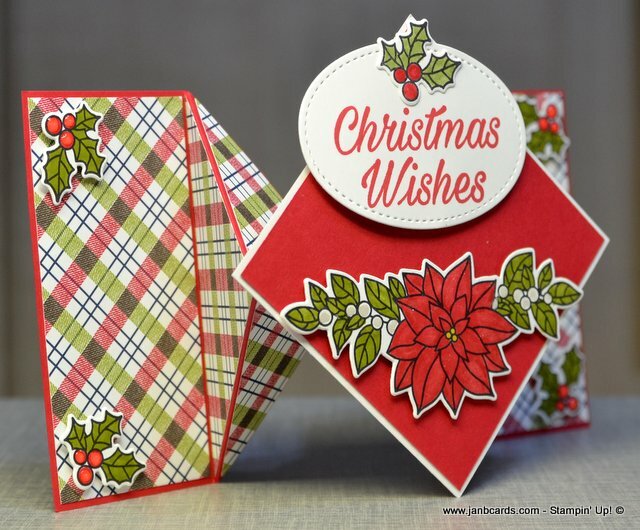 To create the card below I used some Dashing Along DSP – product code 149903 – which was available as a special promotion a little while ago, but is available again now! On this card I turned the central panel straight, and it worked well, but not as well as having the diamond panel! After making one card with the Dashing Deer, and putting the diamond straight, I wanted to see what the deer would look like on a diamond panel! LOL! This card re-assured me, that I definitely prefer the diamond, and that I also like the dry embossed panel. Next time I make a Diamond Fold Card, and I wanted to deocorate the side panels like I have in this card, there are two things I’d cahnge. First, I wouldn’t put images in Dimensionals, and second, I wouldn’t allow my images to be visible when the card is closed flat. I used the Softly Falling EF for the centre, and I remembered to put the cardstock in the embossing fold as a diamond, and the side pieces straight! Last night I posted a BREAKING NEWS blog with details about the Year End Closeout and also the Craft & Carry Stamparatus Bag. I have attached this link to the flyer as Stampin’ Up! are offering the bag on it’s own, or with the toolkit. I have treated myself to this bag and I love it! 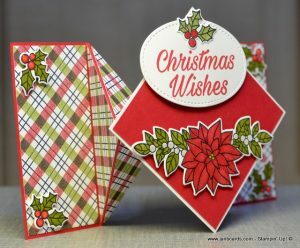 I have also put my Stamparatus Grid Paper in there, together with the templates I made for creating wreaths; I have everything together in one place. That’s about it for now. I look forward to being back with you tomorrow. Until then happy crafting.